Almost every retail owner faces the same challenge: maintaining high levels of stock accuracy. It could harm your profitability if your store does not dispose of the necessary systems to efficiently manage inventory. It is important to know how many products are present, which helps retailers to prevent out-of-stock, shrinkage and overstocks. Need help to realize this? Display the right products to your customers at the right moment by applying solutions of Century Europe. Radio-frequency identification (RFID) solutions by Century Europe are high-reliable, which help to have full control of your store’s inventory. RFID is often combined with Electronic Article Surveillance (EAS) solutions to protect your merchandise. Additionally, store owners can integrate source tagging to secure products throughout the retail supply chain. Maximize visibility and security of individual items with Century Europe’s RFID solutions. Find out more by following the hyperlink below. Read more about our Electronic Article Surveillance (EAS) alarm systems, which help to prevent and detect shoplifting. 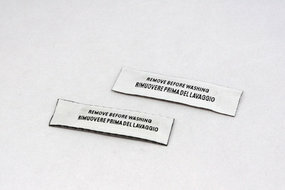 Consider to apply tags or labels directly onto or in the product while producing or packaging. Learn more about source tagging.